There are a few key components when it comes to setting up an answering service plan for your business. Make sure these three pieces are in place to ensure a successful account setup. So what exactly does it take to get a successful answering service program started? A little work needs to be put in on your part up front, but a good partner will make it easy for you. Here we’ll discuss how to set up an answering service, and it all centers around these three parts. Not so fast! There is a little more to it than that in order to get a successful answering service program in gear. A little planning and a lot of follow-through will ensure that your new live answering support service will hit the phones running. 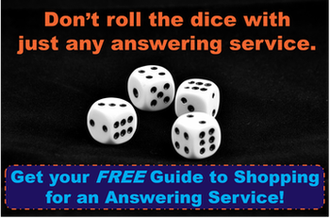 You may not know how to set up an answering service because you’ve never done so before and don’t know where to start. That is OK. You have to start somewhere! How can you possibly train another company to handle all of your calls? After all, you are the only one that really knows how you want things done. Calls can diverge into a variety of directions. How do you “script” the myriad of possible call outcomes? There. That was easy. Now remember, your answering service isn’t going to spend 38 minutes on a sales prospect call – that’s your job. Your answering service simply has to size the call up, gather the appropriate information and relay the message or call to the right person at the right time. You don’t need to worry about scripting out a call that lasts 15 minutes or more. That type of support is called Inbound Customer Support and is a different type of live answering. All you need to do is determine 4 or 5 key pieces of information you need your answering service to gather for you on each type of call and then tell them how to relay that information for you. Then you can take the call the rest of the way home. The important thing is that the opportunity is captured, which is important to keep in mind when thinking about how to set up an answering service. Don’t underestimate the power of a programmer. And especially one that knows how to handle phone calls. The programmer is the liaison between your call handling instructions and the call center agents. They are the person that takes all your instructions and builds out your account so that receptionists can get it right every time they handle one of your calls. But a programmer needs to be more than just someone that knows how to develop a script inside of a computer. A programmer needs to understand how that call handling plan (or script) is going to look to a call center agent in a real-time environment. The key to this position is finesse. Good programmers can develop scripts quite easily. Great programmers know how to build scripts that make call center agents efficient and productive. Exceptional programmers proactively streamline scripting and anticipate an agent’s thought processes in advance because they, too, have handled many calls in a live environment. When you are shopping for answering support, be sure to ask about the programming department. How does it work? Who is doing the set up of your account? What are their qualifications? You need answers to these questions because this is the team you will be working with to make your answering support program a success. Programming is no doubt a crucial piece when it comes to how to set up an answering service. OK, your answering service plan has been programmed. Your scripts have been developed and entered into the system. Now what? Test absolutely everything. Call your account and put your new live answering service through the paces on each type of call you expect to receive. Ensure that your messages are being delivered promptly and correctly. The reason you want to test your service is not only to ensure that agents can follow instruction, but also to find out if your suggested call handling plan is sufficient. Remember, sometimes your customers were expecting to get you on the phone. Now they are getting a professional receptionist, or gatekeeper, and sometimes they react to that a bit differently at first. So you can get unexpected results when your service first goes live. Your customers will quickly become accustomed to your new live answering service and will then begin to trust it to deliver messages to you for a quick response. Have no doubt that all your callers will appreciate the personal attention they receive no matter when they dial. Finally, don’t forget to do a quarterly review of your answering service. Things change over time. Businesses grow. Requirements change. Your answering service needs your help to adapt. Knowing how to set up an answering service is only the beginning. So call every three months and review your call handling plan from top to bottom and ensure that everything is working as it should. You should think about this as tuning up your answering service every three months to keep things fresh and in good working condition. Then you will guarantee success. Interested in seeing this all in action? Contact us today for a free consultation and we’ll walk you through how to set up an answering service for your organization. This entry was posted in Answering Service and tagged answering service shopping by Brian Gabriel. Bookmark the permalink.